Next time you're riding through the woods, take a look at how the sunlight flits around the road through the leaves, feel the the way you dance on your pedals up the hills, then think of unicorns. The above method is guaranteed to lift your spirits to hitherto undiscovered levels, a new state of tranquility on the bike. You will have experienced for yourself the #outdoordisco, and it's a thing. In Vienna they've been dancing to the tune of the #outdoordisco for a while now. It's a state of mind distilled down to a hashtag, and a rallying cry from one of the wackiest, most carefree cycle brands on the planet, Brillibrilliant/unicorn. The courtyard of the Hotel AM Brillantengrund is a popular meeting place. To say BBUC are intrinsic to Vienna's cycle culture would be quite the understatement. They pretty much are Vienna's cycle culture. 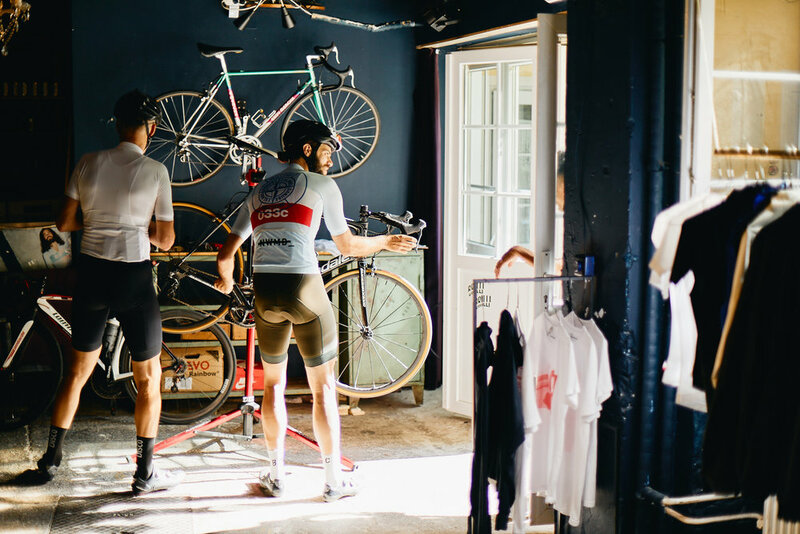 The brand got its mind-boggling monicker from a fixed-gear group ride organised by co-founder Christian Wieners called the Unicorn Ride - "one gear, one horn, unicorn" - and the hotel they pulled into one day. The Hotel AM Brillantengrund provided far more than a coffee or two - it was the genesis of the brand itself. BBUC was conceived between Marvin Mangalino, an owner of the Brillantengrund, and Christian, on a Unicorn group ride. This was around eight years ago. The Unicorns were already raising eyebrows as they rode around town, no-fucks-given. "People were like, 'what's going on with this group? They have unicorns on their butts,'" recalls Marvin. Both Marvin and Christian are old skaters, "a lot of skaters we grew up with are into their bikes now," and have backgrounds rooted in the creative industries. You can see these influences reflected in their unconventional approach to everything related to the brand, from the BBUC clothing collections, both on and off-bike, to the hotel. It could come across as an unpredictable braindump to the casual observer, but everything will have a well-considered narrative. "Everything we do has a story to it," confirms Marvin. Much of the inspiration for the clothing collections comes from the hotel - a bustling cosmopolitan petri dish swirling with the city's cool and creative. It plays a central role in Vienna's vibrant arts scene, and has an ever-changing cast of guests and visitors. "When you look out the window here at the people having lunch you see lawyers, DJs, bankers," says Marvin. "But they share a common attitude to life. This is also everything about BBUC, bringing people together." This is why one of this year's earlier BBUC collections was named the Fictional Nation, in reference to the variety of nationalities who pass through the hotel. The collection imagined a world without borders and its own flags inspired by the Hotel AM Brillantengrund and the Viennese countryside. The recently released Copy Cat Collection takes some of the best-known brand fonts and logos in modern-day urban culture and puts a BBUC spin on them. 'Obey' becomes 'Obey the rules,' in reference to the Velominati, 'Stone Island' becomes 'Danube Island,' which is an actual place in Vienna, and the Continental tyres horse becomes a unicorn. Then there is 'Panasonic,' which becomes 'Pamosonic' in homage to the hotel barman Pamo, who kind of races but not too seriously. "He's in his off-season all year round," says Marvin. So they adapted the 'Off-White' logo to "Off-Season" and stuck that on one of the jerseys, too. The AM Brillantengrund garage acts as a showroom, events space and mechanic's workshop. The resulting kit looks like the product of one of those drunken conversations in the pub where someone says "who would be on your dream cycling jersey?" Then you tell them and they get it made and mix all the names up. Hotel AM Brillantengrund has a pivotal role in the BBUC story. Alongside being among the coolest hotels in Europe (it's official, top 100) it acts as a meeting place, headquarters and clubhouse for those who ride with BBUC. Moreover it is fast gaining a reputation as a cycling hotel per se through its Pow Wow weekends, a regular coming together of riders for a few days of riding and partying, with guided tours of the city, group rides and plenty of nightlife. "From Outdoor Disco to indoor disco." The next Pow Wow, between July 19 and 22, coincides with the city's annual dance festival, ImPulsTanz. The Brillantengrund is a family hotel in the true sense of the word - Marvin's mum even came out of retirement to cook the food - which is probably why it is such an inviting place to visit and why, when they host their regular art exhibitions, they regularly attract up to 700 visitors. In a few short years, BBUC and the Hotel Am Brillantengrund have achieved what many devote countless resources to achieving - a brand people are more than happy to be associated with. This is more credit to the welcoming nature of Marvin and Christian and the hotel than anything else. This has led to some very credible collaborations. BBUC partnered with Viennese design duo Wendy & Jim, former students of Helmut Lang, on their off-bike wear. On the cycling side, BBUC have released a jacket in collaboration with Enve and work closely with Czech superbike brand Festka. Cycling is also where things begin to get interesting for the future. 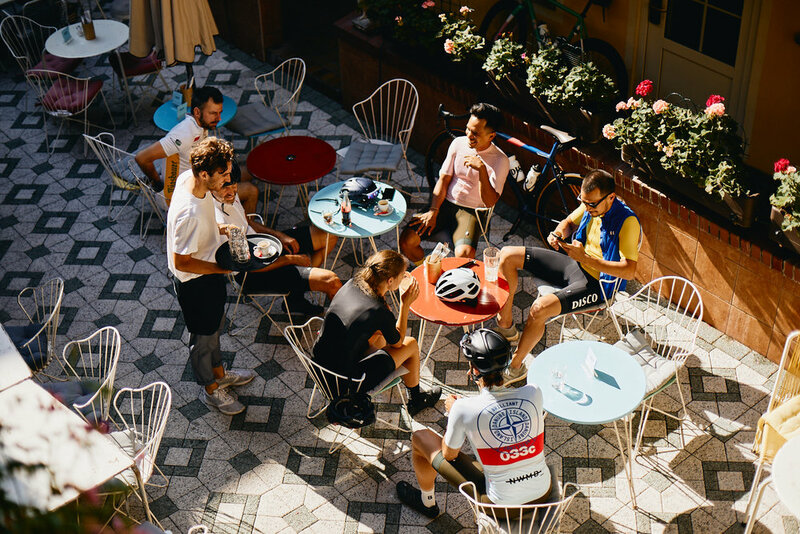 The Pow Wow weekends could become a boutique bike show before long and Marvin is pushing the Brillantengrund as a hotel for cyclists from around the world to stay at as they explore the astonishingly beautiful riding to be had around Vienna. Spreading the vibes and encouraging more people to join the #outdoordisco. "People say to me because of you guys we started cycling, because we like your approach and it’s different. BBUC is far more than a clothing label. For the cyclists of Vienna, it is a way of life, a mantra to follow and a value to uphold. It sounds serious but it is the exact opposite - BBUC are here to make you smile, and to ride your bike. Love cycling, love life and live for the outdoor disco." Follow BBUC's Instagram here and Hotel AM Brillantengrund here. * BBUC are represented by Paperbike's sister brand, Johnny Red PR.